There they were. Every time I went to the grocery store, that bag of caramel chips was calling me. Sure, I resisted for a few weeks, but they finally came home with me. I can resist new baking products for only so long. Honestly, why do I ever hesitate? 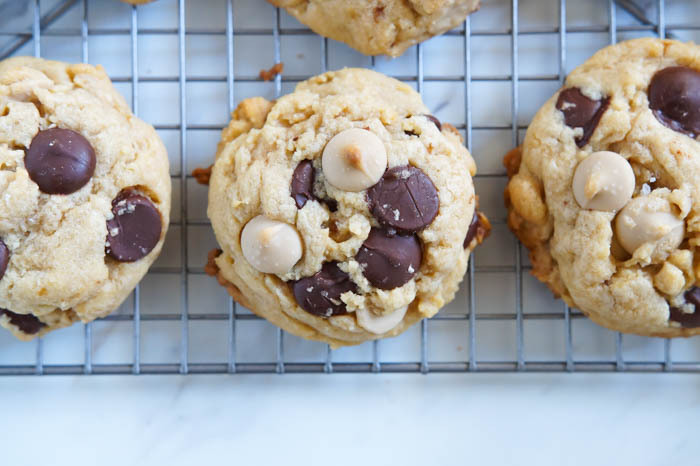 If you are a fan of caramel, you're going to be a fan of these cookies. 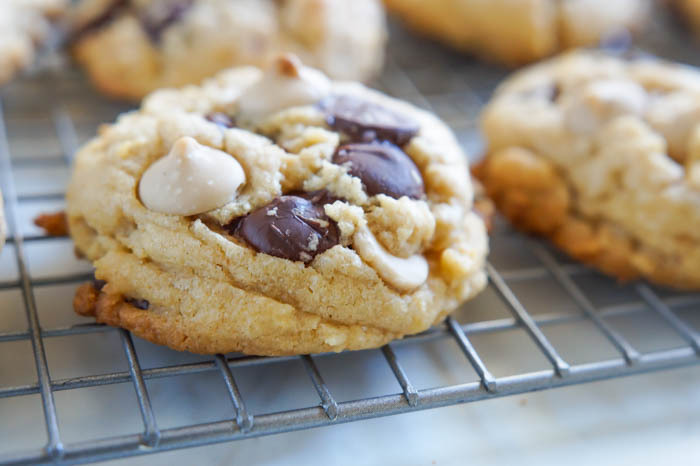 Not only do these cookies have the caramel chips, but also BROWN BUTTER and bittersweet chocolate chips. Oh, and a bit of salt just to cap everything off perfectly. Brown butter. Browned butter. I'm a timid brown butter maker. 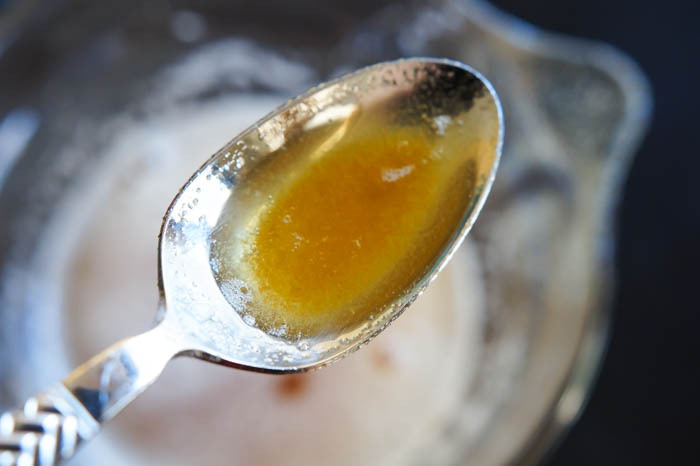 My brown butter is more "golden butter." Come to think of it, that sounds pretty lovely: golden butter. I always follow Jessica's instructions for brown butter. I like how she takes the butter off the heat at the end. I'm less scared of burning it that way. You'll cool the butter before making the cookies. 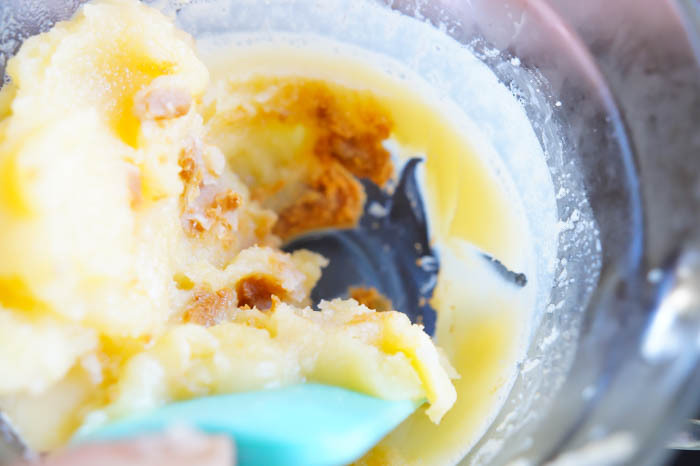 When you're ready to bake, scoop the solidified butter into your mixing bowl. Make sure to scrape all of the browned or golden bits from the bottom. That's where the deep, nutty flavor is. 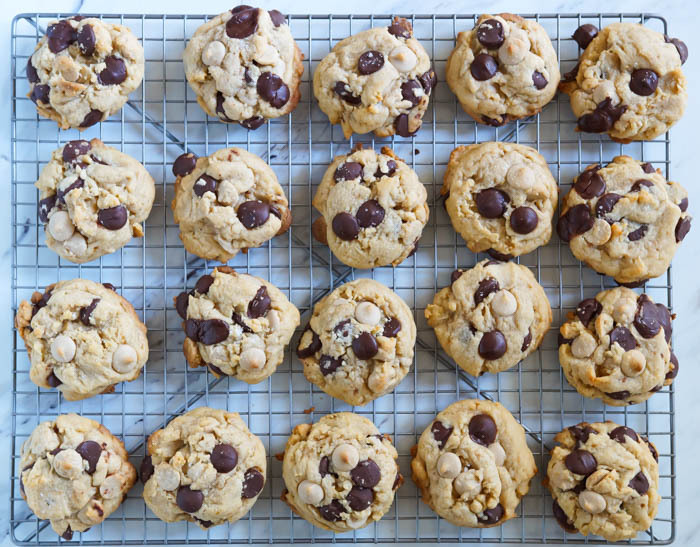 These cookies are chip-heavy. You could make them with fewer chips, or even omit either the caramel or chocolate chips for a cookie with more cookie base. It's up to you. They'll be delicious any way you bake them! Place the butter in a stainless steel skillet or medium saucepan over medium heat. Once the butter is melted, start whisking. The butter will foam, then bubble. Once the butter starts to smell nutty and you see golden bits in the bottom of the pan, remove from heat and whisk for another 30 seconds. Pour into a heat-proof container. Cool at room temperature for 15-20 minutes, then transfer to the refrigerator to cool. Stir the flour, cornstarch, baking powder, and salt together. Set aside. 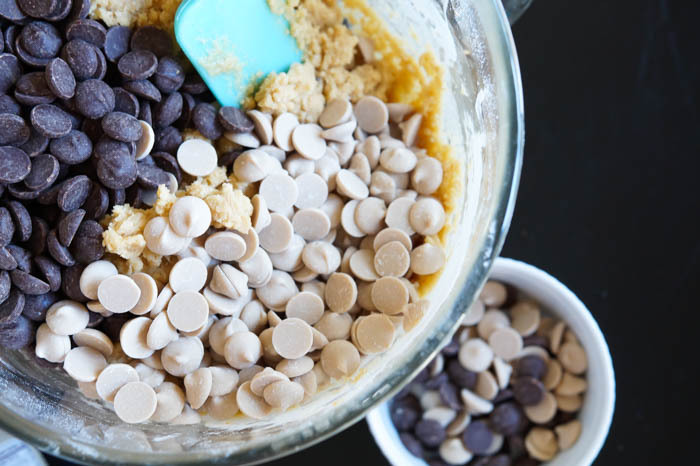 Scoop the cooled brown butter into a mixing bowl. Add the sugars and beat until creamy and combined. Beat in the eggs one at a time, then the vanilla. Add the flour mixture on low speed in three additions. Stir in the caramel and chocolate chips, reserving a few of each for the tops of the cookies. Place the dough in the refrigerator for at least 30 minutes. Use a 3-tablespoon scoop to portion the dough onto the cookie sheets. Press a few of the reserved chips on each cookie. Sprinkle a bit of fleur de sel on the tops. Bake for 10-12 minutes or until done. Let rest on the cookie sheet for a few minutes before transferring to a wire cooling rack to cool completely. Caramel chips...have you tried them? Living in Small town NW Iowa, I had to resort to target.com to get these carmel chips. We will be making them this weekend, after they arrive! Hoping these will make a good 4H project for our youth fair! I could eat about 12 of those right now!! 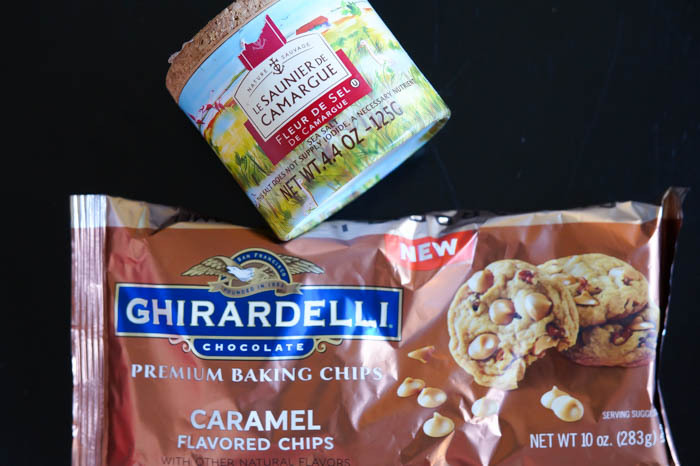 Bridget, I am munching on those caramel chips right now, with pecans! I was so excited to discover these, as other brands of caramel chips taste fake to me. But since I buy exclusively Ghirardelli chips, I figured these would be good. And they are! Your recipe looks divine, I can't wait to make them! These look like some incredible cookies - I love the flavors and how puffy the cookies look!! Yum! Can't wait to try those. Yummmy, the kids just loove it!